Kids Notice all kinds of things. Ask young folks what they’re noticing different in their lives and you’ll get answers! When I was in Minnesota visiting family, I showed my two great nieces the Daily Clean Your House Flow™ animated video. The 7-year-old was thrilled! Presley loved the video itself and with a great big smile said, “Aunt Deb, I’m feeling this buzzy happening.” Morgan, the 9-year-old who had been introduced to self-help acupressure through her mom and grandma, saw that it was a fun way to do her energy work. And she loved the book I’ve written. The next day, Morgan shared what she had learned with her teacher, and he invited her to teach her classmates. They sat around in a circle, and she walked them through the Daily Flow. The next day the same scenario took place. That happened to be the day of standardized testing. The teacher noticed something different in the room. His students were calm, focused and not in angst over the test. And they did better than ever before. Mr. Weiss asked Morgan whether Aunt Deb would be able to come to the classroom, show the video and teach them about self-care. Well, of course, I’m going to show up for that and luckily there was one more day before I had to leave. Mr. Weiss and I had a great conversation before the students filed into the classroom. He said that it really was noticeable how centered the kids were for the test the day before. And how the Daily Flow had helped with calming and breathing. The 4th graders were thrilled that a “real author” was in their classroom, and they had lots of questions about writing a book. They, of course, were all over the animated video. I had to tell them I wasn’t the illustrator! But we spent time talking about the process of making the video. And they loved how much fun it was to do the Daily Flow to the video. And then came the questions about acupressure and what they can do for themselves. Keep in mind that this group of kids had never been introduced to acupressure or energy balancing. They did not know about acupuncture, so I couldn’t make a comparison. So I had lots of fun teaching and sharing. I loved that the kids realized that THEY can make changes happen. Questions revolved around aches and pain, studying and tests, doing better in sports and activities. Now, really? Nine-year-olds who are not sleeping? Nine-year-olds stressed over studying and tests? Kids recognizing that a relationship had changed in three days? That had to be a significant shift for the kids to take notice. I’m excited that kids are seeing changes happening when they do their Daily Clean Your House Flow! Check out the website to read more comments from the children, their teachers, and their parents. 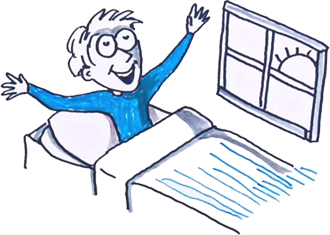 To see the first 90 seconds of the animated video, go to www.dailycleanyourhouseflow.com and see how easy it is for both kids and adults to learn and then want to do their daily energy work! Happy Kids Make for Happy Lives for Everyone! It’s summer time! And life is super full — especially if you have children in your life. Whether you’re a parent or a grandparent or a caregiver or a teacher in hiatus — some portion of some days are spent keeping those kids happy. Happy means that they are active with something that keeps their attention and that they are content with what is happening. All of requires that they are content within their bodies. What on earth do I mean by that??!! Content within our bodies means that our bodies are in a place of ease and balance, that our bodies are energetically prepared for what we’re going to ask them to do and prepared for what might come at them. THAT means we will have clarity and focus, ease in actual physical movement and ease in creative expression. In addition, balance brings the ability to handle our emotions so they don’t get too big, take our breath away and cause us to get stuck IN the emotion. For example, have you ever noticed that irritation can sometimes lead to frustration and maybe even anger? When we don’t address our reaction to what is creating the irritation, it can quickly turn into a bigger, more intense emotion. That increase will be what takes our breath away and causes us to be in the throes of the emotion and then everything escalates. So imagine what a child is experiencing when all of what I have described is happening and they have no experience in how to handle irritation or frustration or anger. Dealing with emotions so they don’t get too big is a learning journey. You can help the children in your life more easily experience their emotions, get the information they need from the emotions, and gain life lessons. Here’s how! Show them the Daily Clean Your House Flow! And see how much easier life can be — for them and for you. In the next few days my new whiteboard animation video of the Daily Clean Your House Flow will be available! Children and adults are finding the video fun to watch and it makes the nine steps of the Daily Flow easy to follow and learn. But even bigger than that — the Daily Flow makes a huge difference in how your children experience their emotions and it will help you create smoother days. You will notice: increased attention span, reduced stress, improved performance, improved health with less illness, increased cooperation, less acting out and increased self-esteem. Stay tuned for the announcement that my new website www.dailycleanyourhouseflow.com is up and ready for you to check out!